Keratin Complex offers a complete, well-balanced range of shampoos and conditioners to keep you hair looking and feeling great day after day – all with natural keratin. These shampoos and conditioners are designed and formulated to complement every hair type and specific need – from maintaining your therapy treatment and hair color, to clarifying and re-balancing, to gentle daily use. In addition, their line of deep conditioners and masques are formulated to achieve healthier looking hair, replenish moisture and leave your locks smooth and strong. Regardless of your hair type, our conditioners and masques are designed to target breakage, stop split ends and seal in color through intense hydration. By blending keratin and smoothing agents like shea butter, our products help all hair types restore bounce and luster and leave you with a fresh, rejuvenated look. Protect your hair from heat, damage and breakage with our line of blow dry aids. Our lightweight formulas smooth and soften while eliminating frizz. Replenish your hair and restore elasticity with our keratin-infused replenisher or hair balm. Looking for intense hair therapy for your damaged tresses? 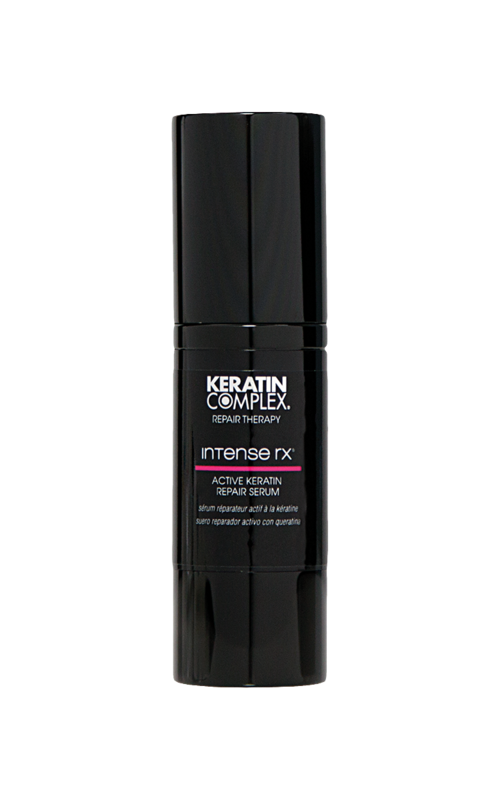 Rebuild your hairs strength in just one application with our Intense Rx Keratin Repair Serum.